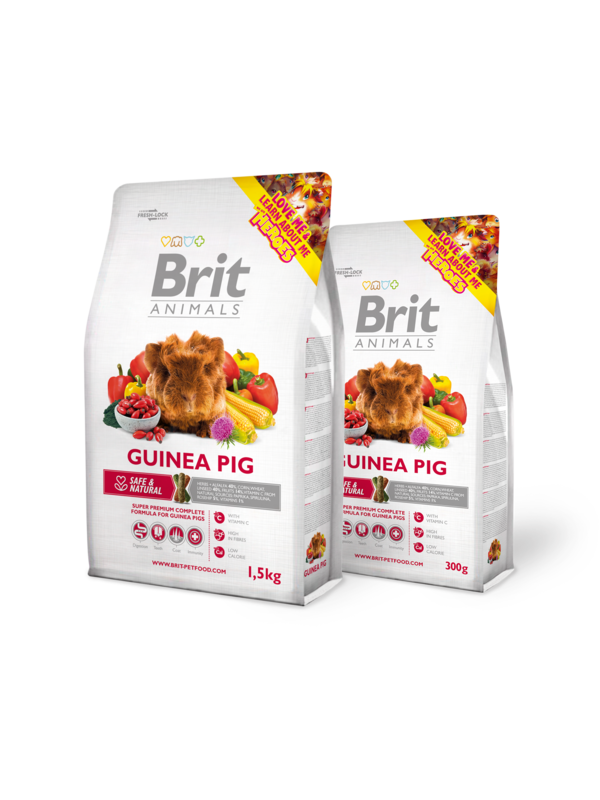 Super Premium Complete Food for Guinea Pigs. With natural sources of vitamin C. Contains milk thistle (Silybum marianum) to promo te healthy digestion and metabolism. alfalfa, herbs (nettle, dandelion, plantain), corn, dried apples, wheat, carrot, rosehips, linseed, brewer´s yeast, Spirulina, paprika extract, mannan-oligosaccharides (75 mg/kg), fructo-oligosaccharides (50 mg/kg), milk thistle (50 mg/kg), Yucca schidigera extract (45 mg/kg). crude protein 12,0 %, crude fat 2,9 %, crude fiber 16,0 %, crude ash 6,5 %, moisture 10,0 %, calcium 0,5 %, phosphorus 0,3 %, sodium 0,05 %. vitamin A 10 200 I.U., vitamin D3 1 250 I.U., vitamin E (α-tocopherol) 70 mg, vitamin C 720 mg, vitamin K 0,1 mg, vitamin B1 1 mg, vitamin B2 2 mg, vitamin B3 6 mg, vitamin B5 3,5 mg, vitamin B6 1 mg, vitamin B9 0,12 mg, vitamin B12 0,02 mg, biotin 1 mg, choline-chloride 200 mg, zinc 72 mg, iron 40 mg, manganese 54 mg, cooper10 mg, iodine 1,8 mg, selenium 0,21 mg.